I think that this project not only tested our skills at designing, but it also tested our patience. To get to this finished product it took a long time and we had to keep on testing and modifying. It also tested how well we knew the design process because if you skipped just one step it could throw the whole process off. I think this was a good learning experience and I think that this project was very fun. Maybe if we had even more time then we could make these projects superb. As I said in my last post, I intended to make 2 more blog posts. This post is to clear up our steps, share our changes in the plans, and explain in pictures what we are talking about. First I will clear up our plan (Look at the pictures below to help). 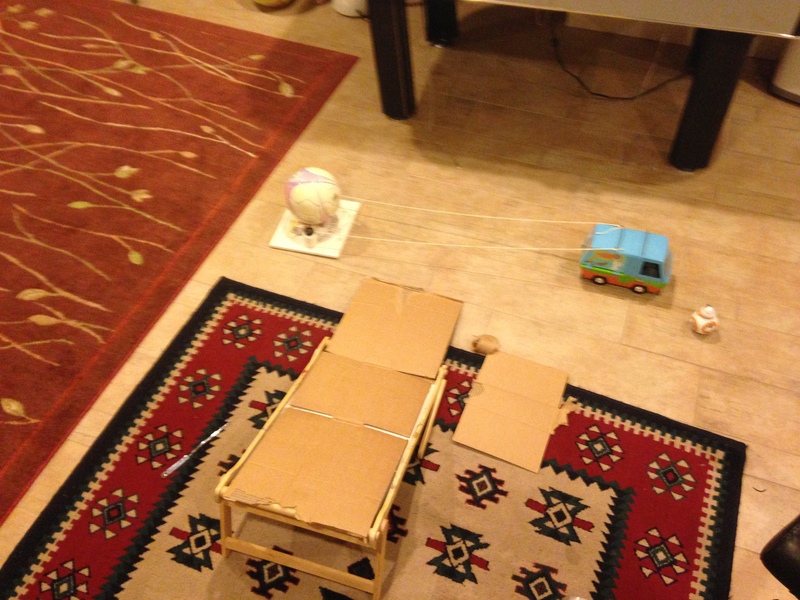 1-2 : Our first step was to have a robot push a car in the opposite direction of a springboard. On this springboard there are weights keeping the spring down, full of potential energy. These weights are attached by a thick string, to the car. When the car moves in the opposite direction of this springboard, it pulls the weights off with it. 3: The springboard that is now released has a ball on it. When the potential energy turns into kinetic energy the springs leaps up, throwing the soccer ball off. 4: This soccer ball, then hits a piece of wood that has a cup full of rocks balancing on top of it. “Why rocks?” you may ask. This is because we need a weight in the cup. This will be explained more in the next step. 5: The cup of rocks will fall. There are more weights, but, they are held on with velcro, ever so slightly, that even one push or tug of a heavy object will make it fall to the ground. This is where our cup of rocks come in. Once those rocks tug on the weight with velcro (they are attached by a string), the weight with velcro falls to the ground. 6: This weight just happens to be attached to a pulley. On the other end of the pulley is a few books. They were only held up because of the weight on the other side. Since this weight is no longer there, the books fall. This is not the end. 7: The books fall on a lever. 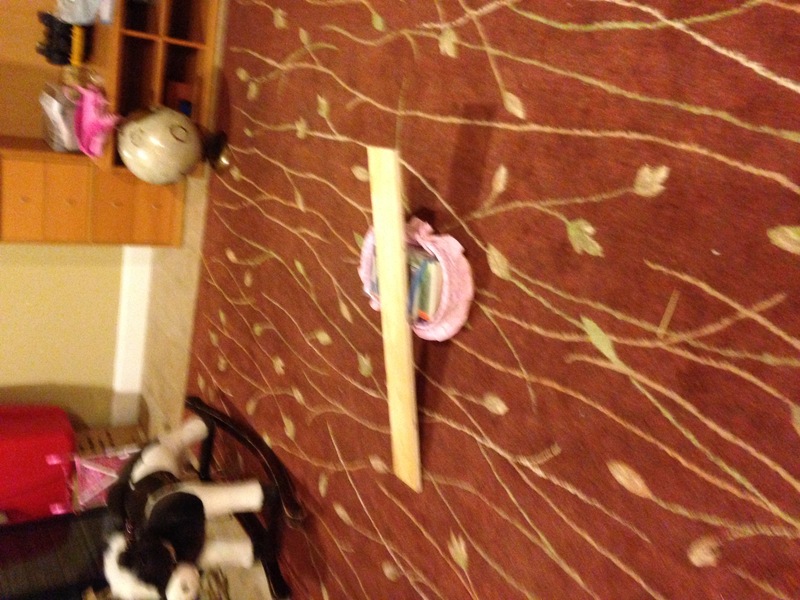 A seesaw, basically. And when the books drop on one side the other side goes up. 8: This other side is wedged into a laptop screen, so then when the side goes up it opens the laptop screen. 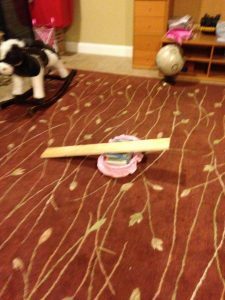 An RC car pushes a wedge that is on a ramp. This wedge is what is holding a plastic car from going down the ramp. 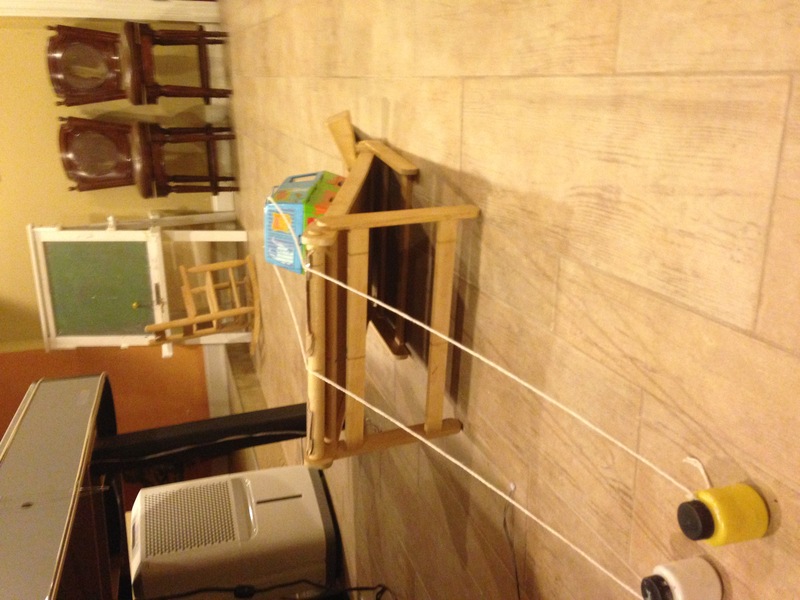 The slightest push and the plastic car goes rolling down so when the wedge is pushed the car goes rolling down and pulls the weights with it. Why? 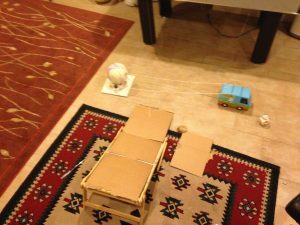 : We decided the robot probably wouldn’t have enough power to push the car. This is because if the car is attached to the weights you have to add the weights weight and add that to the car. If you estimate that a small robot probably wouldn’t be able to push that car. 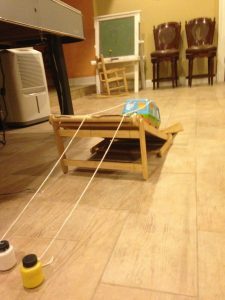 But, an RC car is more powerful and, with the car on a ramp we also have the advantage of gravity, because it is easier to make it go down.